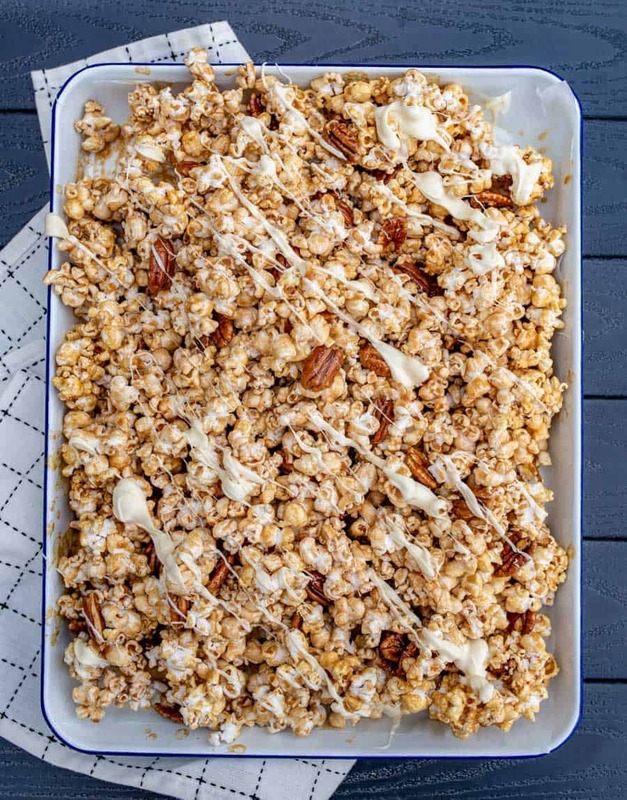 Homemade caramel corn recipe with cinnamon, pecans, and a white chocolate drizzle to make it the most addicting and festive treat you’ve tasted! I love popcorn, like love it love it. We eat it pretty much every day and I’m not sad about it. I consider it one of my favorite whole grains. Most of the time we are just butter and salt kind of people, but when the craving for caramel corn hits, I’m happy to oblige. This cinnamon caramel corn is one of my all-time favorite recipes! It’s so easy to make. It’s a soft caramel corn without being sticky, and the addition of nuts and cinnamon (and chocolate!) really make it a delicious dessert. Plus, there’s no corn syrup in the caramel which is convenient (I don’t always have it in the house). This is a great recipe to make for movie night, to put in cute baggies to give as gifts, or to take to a party to share with lots of people. It’s quick, easy, and delicious. The cinnamon is a welcome surprise, too! No one sees it coming but cinnamon and caramel go perfectly together. What does baking soda do in caramel corn? Baking soda is on odd ingredient that shows up time and time again in caramel things. The purpose of baking soda in the caramel is to react with the acid (the brown sugar in this case), which creates tiny carbon dioxide air bubbles. Once the caramel has cooled on your popcorn, the air bubbles inside the caramel create a softer texture. Be sure to use a medium pan and not a small one so that the bubbling caramel doesn’t overflow. If you don’ t have a popcorn popper, just follow the directions on the bag of popcorn kernels; it tells you how to use a pot and make it on your stove! If you don’t own coarse salt yet, it’s time to get it. Look for it in a box near the other salt. It’ll be labeled Kosher salt. It’s bigger pieces that are flat like the kind on pretzels. Looking for an air popper to meet all your popcorn popping needs? I’ve had this one air popper for years, and it works great. 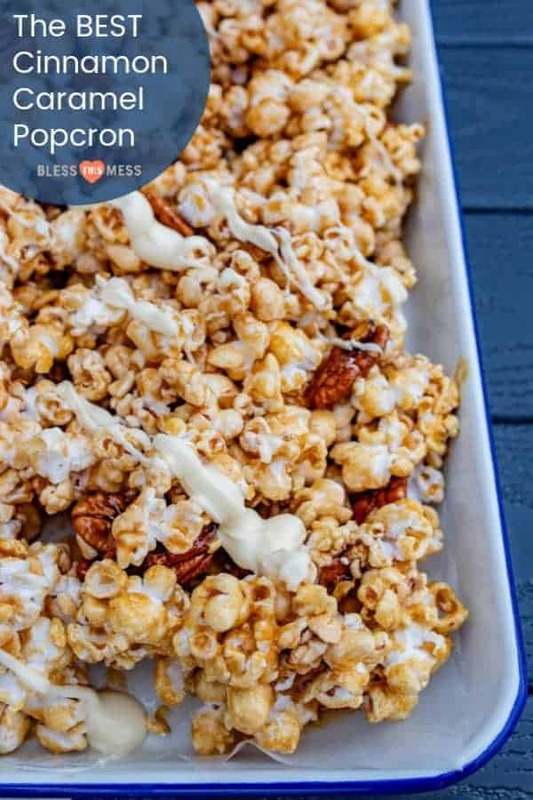 You can substitute the cinnamon for pumpkin pie spice or apple pie spice for a twist on this caramel popcorn. This homemade caramel corn will last 3-5 days covered at room temperature. It technically will last longer but the popcorn starts to get stale and few things are sadder than stale popcorn. 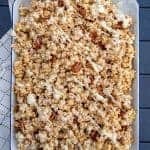 A stickier popcorn (this is my favorite Gooey Caramel Corn recipe if you need one) will last closer to 2 days because the moisture in the caramel makes the popcorn go stale faster. 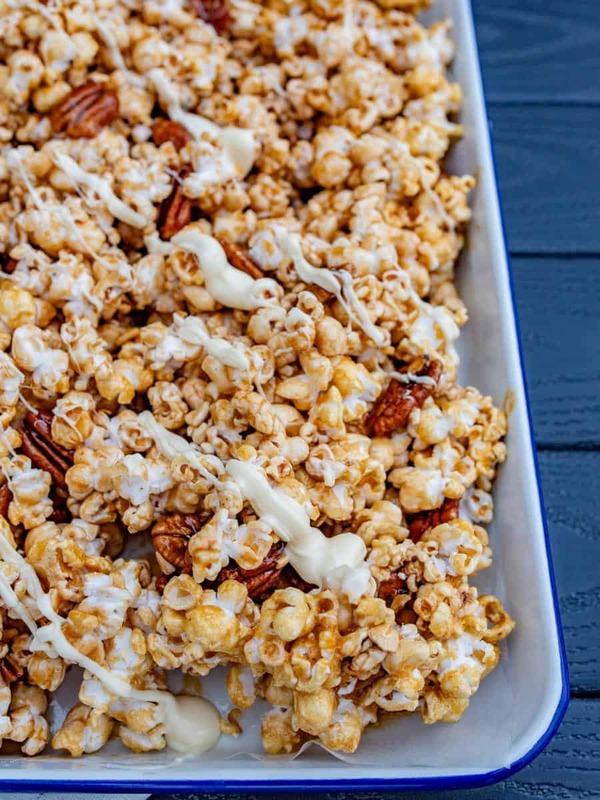 Homemade caramel corn with the addition of cinnamon, pecans, and a white chocolate drizzle to make it the most addicting and festive treat you’ve tasted! Preheat the oven to 275 degree F and grease a rimmed baking sheet well (you can also add a layer of parchment paper, but be sure to still spray it with cooking spray). Pop the popcorn and set it aside in a very large bowl. In a medium saucepan, combine butter, corn syrup, brown sugar, and salt. Cook over medium heat to allow sugar to dissolve completely and bring to a boil, stirring often. Remove from heat and add baking soda, vanilla, and cinnamon. Stir well to combine. Add the pecans to the popcorn. Drizzle with caramel sauce over the popcorn and pecans, stirring well to coat. Spread the popcorn mixture out onto the prepared cookie sheet. Bake for 8-10 minutes, stirring halfway through the cook time and again after you pull it out of the oven. 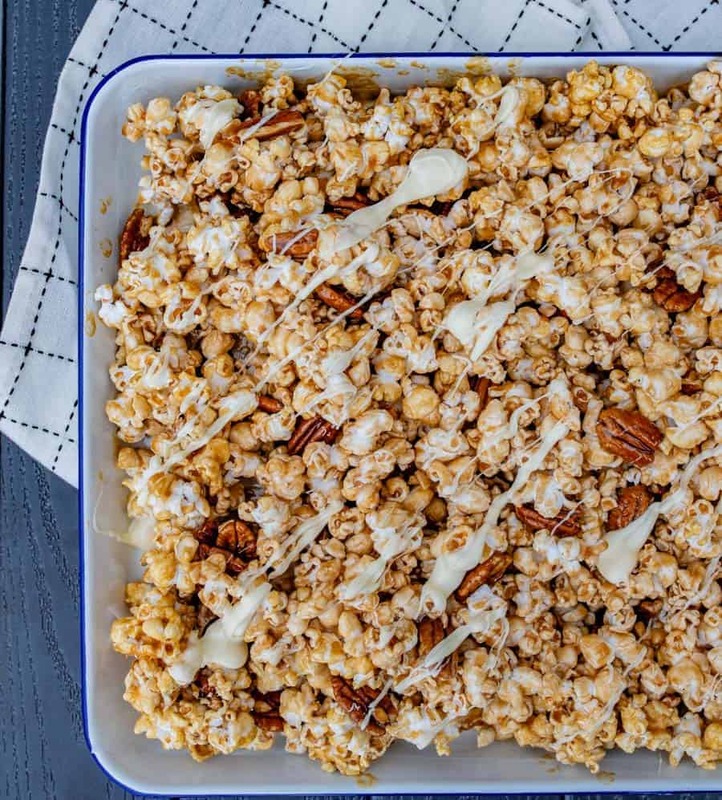 Melt white chocolate in a double boiler on the stove (or in the microwave on 50% power, stirring every 30 seconds) and then drizzle over the popcorn. Sprinkle with extra coarse salt before the chocolate sets if desired. Let the popcorn cool and the chocolate set and then break the popcorn into chunks and serve. Store leftovers in a covered container for up to 3 days. If you don’t have a popcorn popper, just follow the directions on the bag of popcorn kernels; it tells you how to use a pot and make it on your stove! Looking for an air popper to meet all your popcorn popping needs? I’ve had this one air popper for years and it works great. Thanks for enjoying one of my favorite simple recipes with me. It’s one you are going to fall in love with. This recipe was originally published in March 2010 and has been rephotographed and updated in December 2018. I love that you’re doing a food blog!! And I love that you are doing photos with it, because I like to look at the photos! It makes the blog sooo much better!! 🙂 Miss you! Thank you for this great recipe, Melissa! This is just a wonderful idea for the holidays. I made this on Christmas and it turned out absolutely delicious! My family loved this and ask me to make the same on the New Year! Woohoo! I’m so glad that you all loved it as much as we do. It’s so addicting isn’t it!